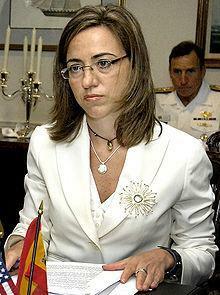 Bio: Carme Chacón Piqueras is a Spanish politician who was Minister of Defence from 2008 to 2011 in the cabinet led by Spanish Prime Minister José Luis Rodríguez Zapatero. Born: March 13, 1971 in Miami. USA.